This quest starts early in the concurrent quest, The Fallen, but only if the Jarl of Whiterun (Balgruuf or Vignar) insists that a truce must be negotiated before allowing Dragonsreach to be used to capture a dragon. If either side of the Civil War controls at least eight of the nine holds of Skyrim, a truce can no longer be negotiated, and this quest will not be triggered. If you wish to receive a reward for completing this quest, you must have joined either the Imperial Legion or the Stormcloaks. Furthermore, it is best to do this quest soon after choosing a side in the civil war. 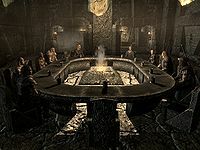 As you complete more of the Reunification of Skyrim or Liberation of Skyrim, it becomes more and more difficult to negotiate a treaty that favors your faction and thus obtain a reward. Following phase one, one of the two sides always threatens to walk out of the negotiations. Esbern needs to intercede with a speech reminding everyone about the threat posed by Alduin before negotiations can resume. A series of offers is made to appease the side that almost walked out. You are given the choice of whether to accept or refuse each of the offers. These offers continue either until the truce is balanced (neither side is favored by the overall truce) or until all options have been exhausted. If the final score is not zero, the side favored by the treaty is pleased by the results. If you have joined that side's faction you will receive as reward one leveled enchanted weapon. If instead your side is left at a disadvantage, you are accused of betraying your side, but there are no lasting consequences. (This was not always meant to be the case—see the Notes section for details.) If you do this quest late in the Civil War it may be impossible to negotiate a treaty that favors your faction and therefore impossible to receive the reward. There is recorded dialogue present in the game files. This indicate there were originally plans to make it possible for both sides to be asked to pay compensation for a massacre which could have happened at variety of possible locations. Only the alleged Stormcloak massacre at Karthwasten was actually implemented into the game upon release. The ninth hold is Whiterun Hold, which is originally neutral. It is not part of any trades in Season Unending because it is implicitly at the heart of the negotiations: the primary goal of the truce is to get the side that does not currently control Whiterun to agree to not attack the hold. The opening demand is always made by the side that is not allied with the Dragonborn. The demand is that they be given a major hold. This means that the opening demand is always for The Reach (if being made by the Stormcloaks) or for The Rift (if being made by the Imperials). Even if the civil war has started, these holds are guaranteed to have their original affiliation: the winning side is being asked to give up a hold, and the winning side has never lost any of its original holds. Before Ulfric even sits down at the council table, he insists that the Thalmor representative, Elenwen, be removed. Either Tullius or Ulfric (depending upon your affiliation) will ask you to decide what should be done. Although you may have to go through an extra round of dialogue if your decision is unpopular, your decision is always obeyed. Having her stay makes the Imperials happier with the overall truce, but causes Galmar to nearly storm out; this option also has the more humorous dialogue. On the other hand, her departure makes the Stormcloaks happier, and angers Rikke. Other than this incident, she has no real role in the negotiations. However, when it comes time to make a counter-demand, everyone turns to you: you are asked to suggest which hold should be exchanged for the Reach/Rift. As detailed above, there are multiple options for the counter-demand, but normally you are able to suggest either a minor hold or a major hold. The major hold (the other of the Reach or the Rift) is always the choice that is favored by your side, and is immediately accepted. If you instead suggest the minor hold, your side will question the decision, and give you another chance to opt for the major hold. You can change your mind, or else persuade your side to go with the minor hold. If your Speech skill is at least 75, you are able to convince your side that the minor hold has some small advantage. If you fail the persuasion check you instead have to fall back on "You asked my opinion. I gave it to you," which forces a reluctant acceptance of your decision. Before the entire truce is abandoned, Esbern intervenes with an impassioned plea reminding everyone about the importance of these negotiations. In particular, he emphasizes that any soldiers killed in the war end up strengthening Alduin, because Alduin feeds on their souls. His speech is enough to convince everyone to sit back down and resume the talks. Additionally, if you allowed Elenwen to stay, she will begin to respond to the speech, but either Tullius or Ulfric will cut her off. The person who responds is determined by whoever has gotten the shorter end of the negotiations so far. If an additional terms is accepted and it evens out the treaty, then negotiations end. Otherwise, the disgruntled side continues to complain about the unfairness of the treaty, and then come up with another suggestion. If there are no remaining options, the disgruntled side will abruptly switch from refusing to accept the truce to instead conceding that it's the fairest deal they are likely to get. Once the negotiations have reached their conclusion, Angeir will summarize all of the terms that have been agreed upon so far, and confirm those terms with each of the parties. Tullius and Ulfric will both agree (albeit with some grumbling), and the meeting will adjourn. Most of the parties will head back to their respective cities, but the Greybeards, the Blades, and the faction currently controlling Whiterun, the Empire if neutral will remain to talk with you about how to proceed with trapping a dragon, thus automatically leading back to the quest The Fallen. Esbern will teach you that the names of dragons are always three words of power, and inform you that while you were preparing the negotiations, he retrieved a scroll listing the names of many of the dragons slain by the Blades. Cross-checking it with Delphine's map of Dragon Burials, he discovered that the next dragon's name is Odahviing. While he won't be compelled to come when called, dragons are, by nature, prideful creatures, and he will not ignore this challenge. Your victory in your previous battle against Alduin will make him even more likely to respond to your Voice. Esbern will then teach you the shout to call Odahviing. In addition, Delphine will walk up and demand that you kill Paarthurnax, if the quest hasn't already been given. At stage 50 of The Fallen (defeated Alduin), the quest Paarthurnax will begin, though it will not be displayed in your journal. After the treaty has been agreed, Delphine will attempt to talk to you and tell you about the quest. Speaking to the participants in the Peace Council, 'moving' them into the Council Room, or waiting for 24 hours may fix this. If not, just reload a previous save. Using disable and enable on Galmar Stone-Fist may fix this issue. Esta página foi modificada pela última vez à(s) 10h15min de 9 de março de 2016.